The Tillikum Lens Project is made possible through the work of many people and organisations. The International Sustainability Education Foundation created the project and coordinates all the partners and people involved. Sony Canada has been very generous through supplying not only cameras for the participants to use but also staff time for the workshops and outside of the workshops. The First Nations have all worked together with us to make these workshops and the entire Project a success. 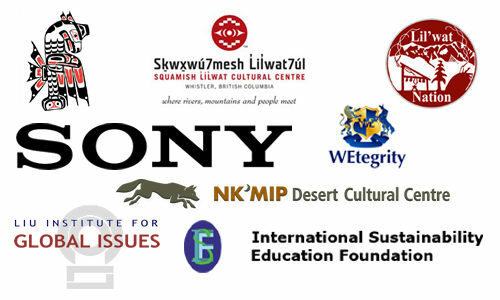 The Liu Institute has supported the project from the beginning and will host a show of the participants photography and of course the entire conference would not be possible without the support and partnership of the Squamish Lil’wat Cultural Centre in Whistler. There have been many individuals working behind the scenes to make this project a reality with special mention going to Court “Siginaak aka Blackbird” Larabee, Project Coordinator, Coach and Web Guy from the First Nations Snowboard Team. Court connected up many of the people which allowed this Project to happen. Of course none of this would be possible without the support of the Professional Photographers who are the core of the Tillikum Lens Conference. A complete list of these photographers and links to their individual websites can be found here. There are many volunteers involved in making a project like this happen and grow and if you would like to become involved please connect with us here.